Wow. Where to even start. I have to admit, I’ve felt completely daunted by the task of sorting pictures and trying to organize a succinct Quilt Market experience post. It’s about as overwhelming as the vastness of Market itself. Booth after booth of inspiring fabric, color, patterns and people. It’s truly huge. I’ve tried to condense my thoughts and my pictures, but even so, I’m going to have to do a Part 1 and Part 2. (above). For those unfamiliar with Denyse, she is an icon and a major influence on the modern quilting movement as well as both pattern designer and fabric designer. Her quilts are a wonderful mix of traditional with a twist and her sense of color is incredible. Should I gush some more? It was truly a ‘pinch-me’ moment to listen to her speak and see her quilts up close. I did not dare to touch them for fear of my sweaty palms doing irreparable damage.
. Both of them were inspiring. 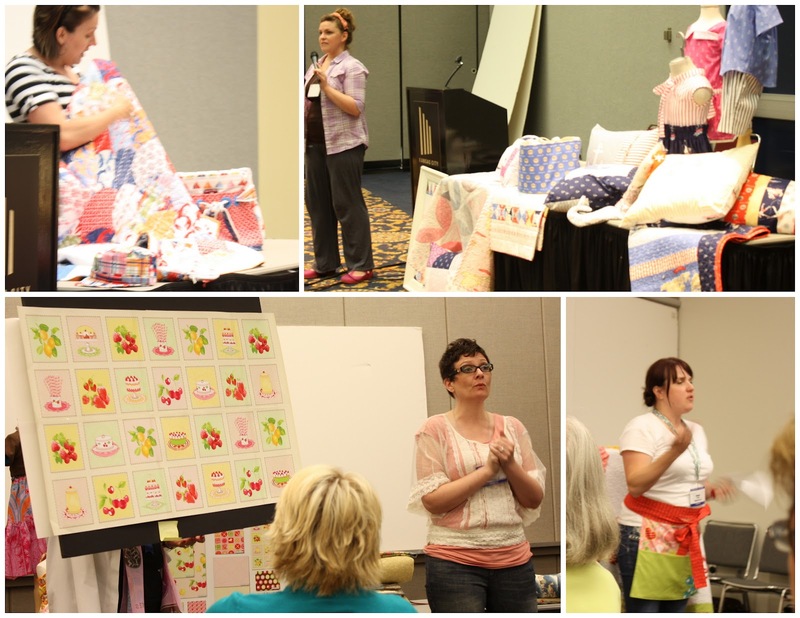 Amanda Jean’s blog, Crazy Mom Quilts, was one of the first quilting blogs I ever read: “You mean there are women my age who like to make quilts and share pictures of them on the internet? !” She has been a perennial favorite ever since. A few other snippets of School House: Emily Herrick sharing her new Shore Thing collection, Sarah Jane sharing Out to Sea, hilarious Jana sharing her first collection as fabric designer, Delicious Wishes, and the ever-energetic, Amanda Herring talking about Apple of my Eye. (I was so excited that she handed out apples in her class because I was starving!) Pardon the blurry pictures. Inside lighting + distance = crappy shots. My main reason for actually going to Market this year was to help my friend Emily man her Geared for Guys both. Emily had not one, but two booths, this market. One for her new fabric collection for Michael Miller, Shore Thing and a separate one for her new book, Geared for Guys. It’s hard to be in two places at once. Here she is in her Shore Thing booth with her cute Dad. Don’t you love his shirt made out of the sailboat fabric from her collection? I also got to piece one of her new quilts (the one with the circles hanging over the blue shutter) and bind a couple others. (Including one on the airplane ride to KC.) It was very fun to get a sneak peak of this new collection. I was excited that I was able to get out and roam for a bit as well! Next door, also in the Michael Miller area, was Violet Craft and her newest collection, Madrona Road. SO. Cute. And next door yet again, Sarah Jane’s newest collection, Out to Sea. 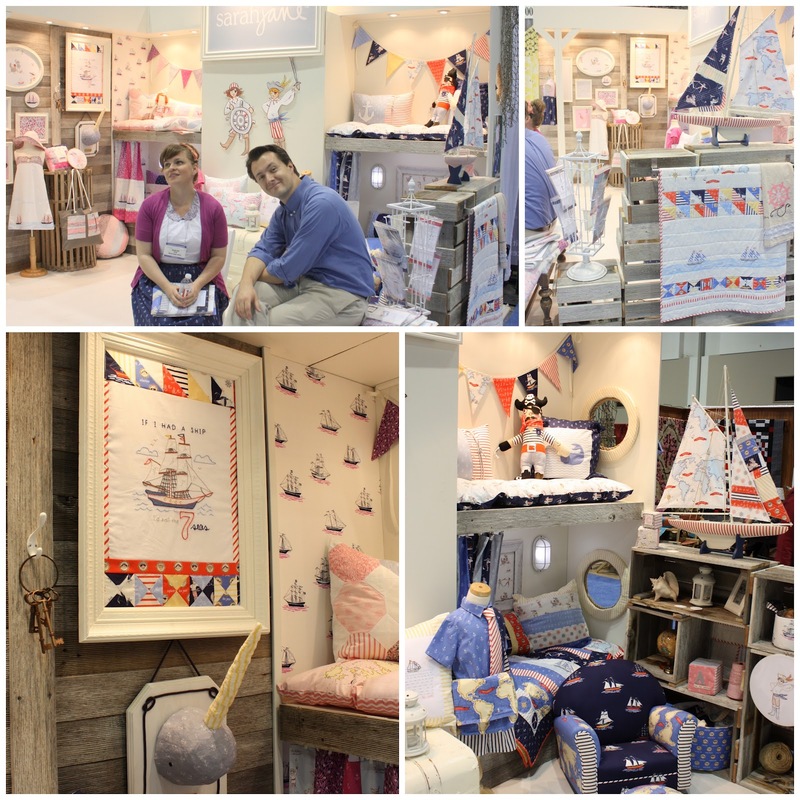 Just like last year with her Children at Play collection, she’s created a boy color palette and a girl color palette, all with a nautical twist, including pirates, mermaids and narwhals! Above is Sarah with her awesome husband Ken who disassembled their old backyard fence to build the weathered wood wall on the left and crates on the right. Talk about an great team! I was lucky enough to do a little bit of sewing for Sarah’s booth again this year. I did the piecing around the Ship stitchery (hanging above the adorable Narwhal head). I also created this quilt, designed with Sarah Jane, to go with her map and ship panels. There will be a free PDF pattern for this quilt when the fabric is released later this summer. 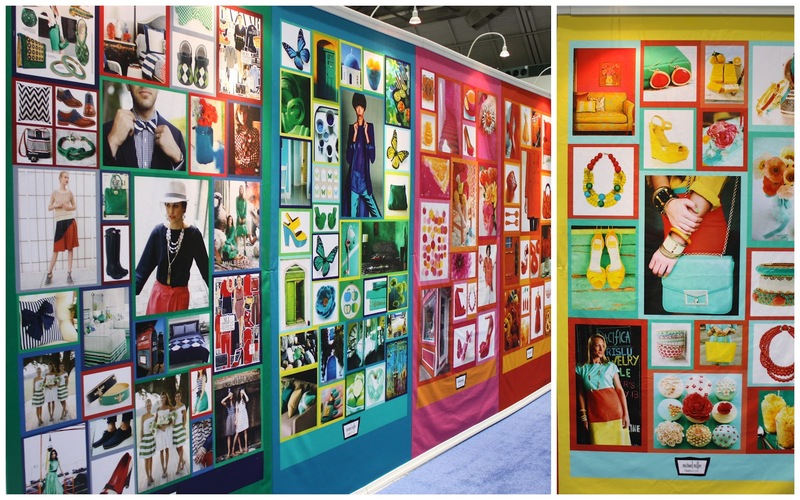 Another aspect of the Michael Miller area that I loved, is their color inspiration wall. SO many pretty pictures to look at! Riley Blake has some beautiful new collections. Above left (going clockwise) is Amanda’s Apple of my Eye, new collection The Simple Life, Lori Holt’s Millie’s Closet, and new designer, Carina Gardner. 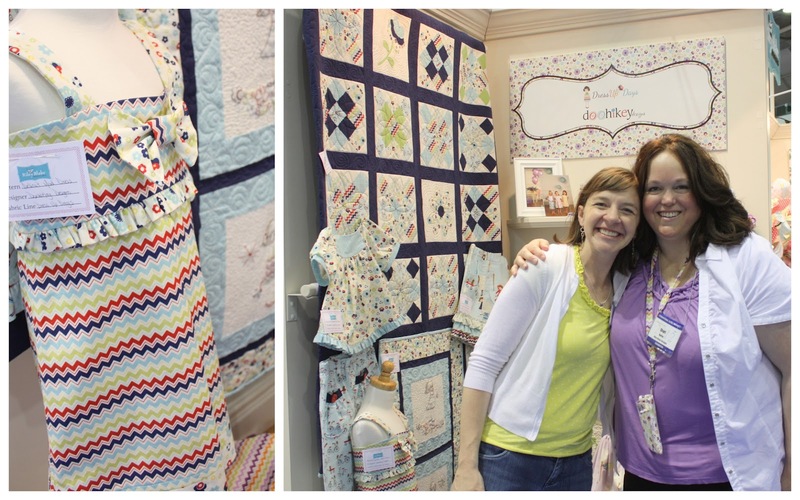 Also at Riley Blake, the very sweet Shari of Doohikey Designs. I love the zigzags in her new collection, Dress Up Days. Shari is about as sweet and genuine a person as you can find. 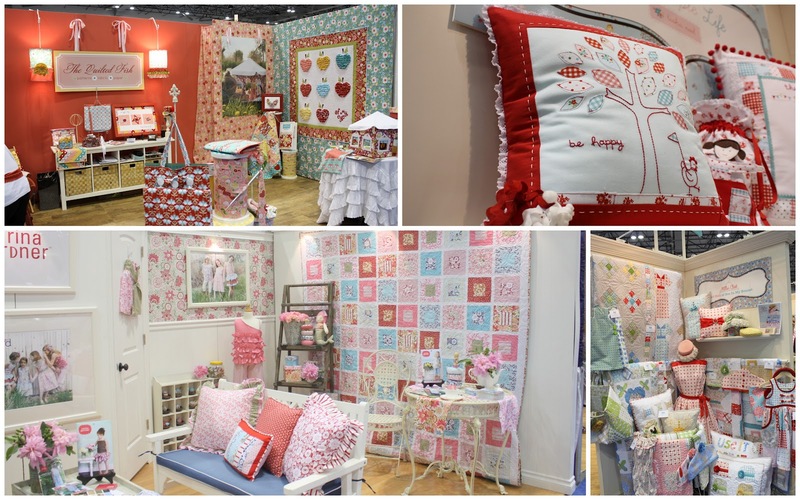 There were lots of newer fabric companies represented with some gorgeous new designs such as Dear Stella. I especially love their Town and Country line – more London fabric! 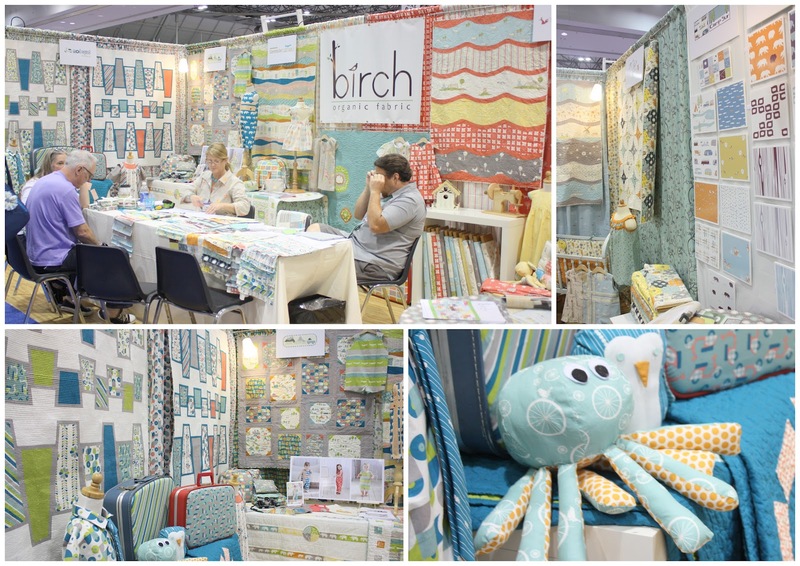 I also love the fresh collections from Birch Fabrics. SO adorable. It was one of my favorite discoveries at Market last year and the love continues to grow. Monaluna fabric is another new, adorable organic fabric collection. The designs are so fresh and cute. 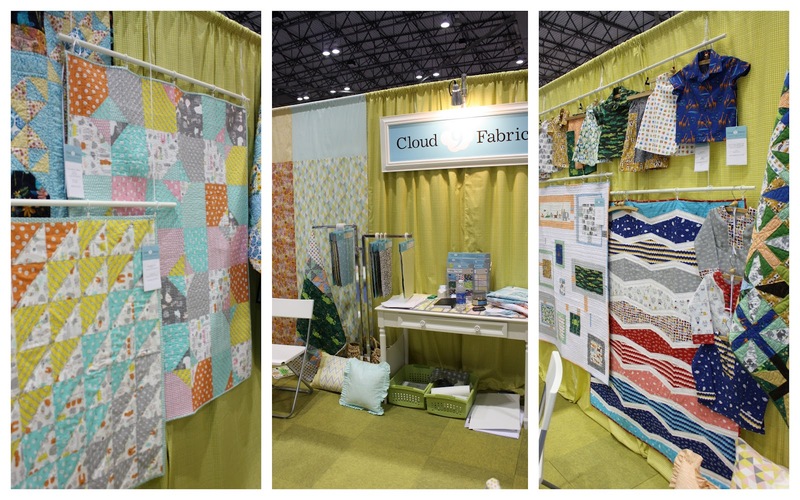 And a final new and upcoming player in the organic fabric market is Cloud 9 Fabrics. Thank you for sharing, so much talent out there. Looks like it was an amazing time of fun! I love seeing everyone&#39;s pictures! I loved Carina Gardner&#39;s new line. I bought some at Sample Spree and have already started on a project. What a great post!! Thanks for sharing with us!! Fabric fun overload! 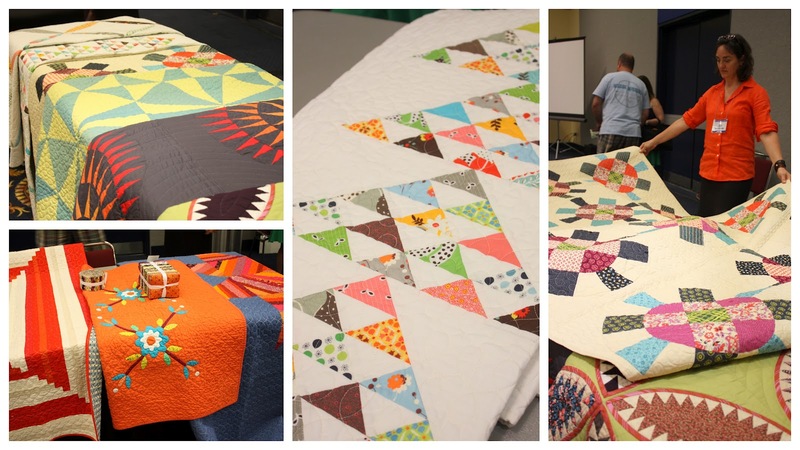 I am now obsessed with that Sarah Jane fabric – that quilt you made is super cute. Especially with the free download, I&#39;m thinking I&#39;ll need to make one later this summer. Thank you for sharing your experience with us! I&#39;ve been looking over the photos closely and feel almost like I&#39;ve been there! My head is exploding. So much creativity in this world. That will never be me. But the world always needs people to appreciate other people&#39;s work. I gladly accept that role. Thanks for sharing. I could comment on every single photo. Thank you for making this post. I do know it is a crazy thing to capture, no less organize. Good stuff here. I&#39;m excited about all I see. I love Jana&#39;s line. I want to see more of that. I love her. I am excited to see all the color. I guess that is what jumped out is the lovely colors. Can&#39;t wait for part 2. Oooooo — Amy! What a fabulous round-up:). I missed a few of these booths, so it&#39;s nice to check out some extra images. Also very cool to see some of the quilts that you pieced. i love all your market pictures! it looks like it was a blast!! love the quilt you made for sarah jane! her booth looks amazing!! oh my. i may have to add quilting to my to LONG to do list. hehe. Thank you so much for the picture tour of Market! What a treat! Wow. Thank you for &quot;taking&quot; me to market!! There are some beautiful fabric coming on the market and very talented people behind them. I love all that you shared and can not wait for part 2. Thanks again. I can see why you are overwhelmed. So much great stuff! Thanks for sharing these photos and thoughts. So glad to see your there!!!! How do you keep yourself from saying &quot;I will have one of those and one of those … and on and on and on!! Truly amazing to see so many beautiful fabrics in one place with such beautiful displays!! Lucky you! I am such a Denyse fan, I would have been sweaty palms too. She would have been my top pick at schoolhouse. And so many fun pics from Market. Thanks for sharing. Beautiful photos!!!!!! I am still drooling form everything I saw!!!! Also, I really hope you guys are right about navy being the next big thing! so I am totally smitten with Sarah Jane&#39;s fabric… I think I need to add all of it to my stash! and that quilt you made is soooo fun! There is entirely too much quilted goodness in the photos of this post. I MUST learn how to quilt. I must learn how to quilt. Thanks for sharing.